Each year AIS accredited judges vote for a variety of awards for irises. Awards are listed in the order of eligibility after and iris has been introduced into commerce. In most cases an iris must win one award to be eligible for higher awards. Awards are judged on garden performance. Honorable Mention (HM) awards are awarded each year to irises of each classification. Registered bearded irises are eligible the second year after introduction. Registered beardless irises are eligible the third year after introduction. Award of Merit (AM) awards are given to irises from each classification each year. 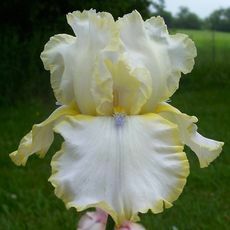 Any iris is eligible the second year after previously winning an Honorable Mention (HM). Only AIS registered judges may vote. Special Medal Awards – To become eligible for a special medal, an iris must have received the Award of Merit. Eligibility begins the second year after the variety has received it’s AM and continues for a period of there years. In any given year the judges may not award a special medal if there are not three eligible varieties. These awards are voted on by AIS members (not necessarily judges) attending the AIS National and Regional conventions and by symposium ballot. The President's Cup - The President’s Cup is awarded annually during The American Iris Society’s national convention. Eligibility is restricted to introduced irises originated within the host region for that year or originated by a hybridizer whose garden is included on the official convention tour, regardless of its location. Irises must have been seen growing and in bloom in the meeting’s official tour gardens, but need not be official guest irises. Each registrant may vote for one variety, and The President’s Cup is awarded to the iris with the largest number of votes. The Franklin Cook Cup - The Franklin Cook Memorial Cup is awarded annually during The American Iris Society’s national convention. All introduced irises seen growing and in bloom in the official tour gardens of the meeting are eligible for the Cook Memorial Cup, except irises originated within the host region for that year or originated by a hybridizer whose garden is included on the official garden tour, regardless of its location. Irises considered need not be an official "Guest" iris. Each registrant may vote for only one variety and the Franklin Cook Memorial Cup is awarded to the iris receiving the greatest number of votes. The Ben R. Hager Cup - The Ben R. Hager Cup, first awarded in 2007, is awarded annually during the American Iris Society's annual convention. All introduced median irises (SDB, IB, MTB and BB) seen growing and in bloom in the official tour gardens of the meeting are eligible. Irises considered need not be official guest irises. Each registrant may vote for one median iris variety and the Ben R. Hager Cup is awarded to the median iris receiving the largest number of votes. Fred and Barbara Walther Cup - Awarded annually by The American Iris Society to the originator of the iris variety that received the greatest number of votes in the Honorable Mention Award balloting, regardless of classification. All classifications of irises are eligible.